NASA recently announced that the Voyager 1 probe, launched in 1977, has finally exited the solar system, sloughing off the tenuous hold of the Sun’s gravity and hurtling sleekly into the inky desert of interstellar space. Valonielu, the third album from Finnish experimental black metallers Oranssi Pazuzu, evokes that same journey. Tethered to an increasingly distant musical tradition, Valonielu finds the band ready to slip the reins and dart orthogonally — irresistably — to vistas unknown, and maybe unknowable. For a small country, Finland has produced an absurd wealth of black metal. Interestingly, though, Finnish black metal has largely proceeded down two sharply dichotomous tracks, favoring either ultra-rigid orthodoxy or resolutely oddball experimentalism. Oranssi Pazuzu, however, seem to know black metal’s history without pledging fealty to it, and are willing to paint avant-garde lines with a familiar brush. 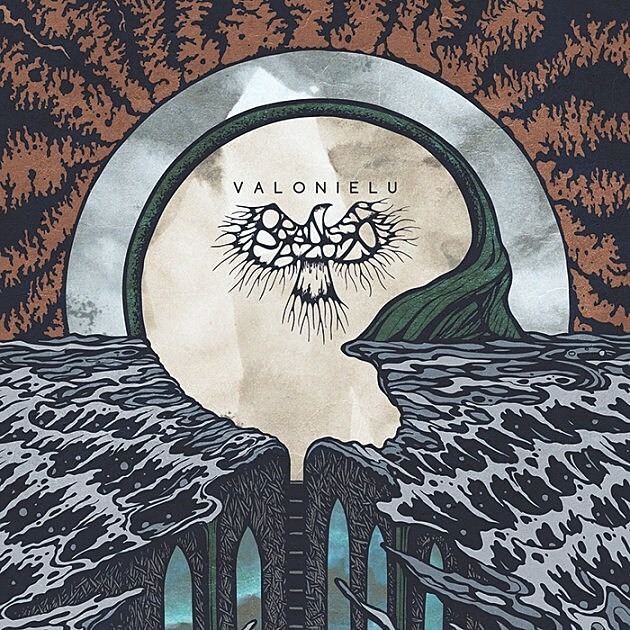 Valonielu is thus a bold, intelligently crafted statement that also manages a rare feat: it nudges black metal in directions that listeners outside of metal might find approachable, but in a manner that feels much less likely to drive traditionalists to apoplexy (cf. Deafheaven). Regardless of its lineage, Oranssi Pazuzu’s music is inescapably psychedelic, given the way black metal signifiers are twisted and refracted through a prism of effects-heavy space rock. The trance-inducing results are honestly won, however, and not merely approximated via studio trickery. Despite the surfeit of bleeps and bloops – not to mention swoops and szzzzzzzrts — Oranssi Pazuzu’s oddness is compositional. Both “Vino Verso” and “Tyhjä Tempelli,” for example, are written in 4/4 time, but they certainly don’t feel it, as guitar lines stretch across measures and queasy synths stab in jarring rhythmic counterpoint. And unlike the band’s previous album Kosmonument, which tended too much to meander, Valonielu has taken all the excesses of Oranssi Pazuzu’s influences – from Krautrock to ’70s prog to space rock — and honed them to a razor-fine point. If you’re ever in a pinch to bring a phobic friend under this vast noisy tent of heavy metal, Valonielu contains enough signposts to direct fans of Hawkwind or Kraftwerk, and hell, the nervously insistent snare rolls on the chorus to “Tyhjä Tempelli” could even bring along a few Swans partisans (via Love of Life). Oranssi Pazuzu are likely no strangers to Rush, either, given how clearly Valonielu was designed and sequenced like a classic LP: each side features two shorter songs, followed by a lengthy, slow-burning freakout. Album closer “Ympyrä On Viiva Tomussa” starts quiet and creepy, like an astral twin of Led Zeppelin’s “No Quarter,” but eventually breaks out into a widescreen squall. A brief calm in the song’s final third is anchored by heroically restrained bass playing, but ultimately the song cannot help but explode into a tantalizing choir of instrumental voices. It’s an immensely powerful crescendo made all the more affecting because of its brevity and internally faultless logic: We’ve burned past the old sun, so now, what’s next?